Visit nine solar and thermal powered homes in OTR, North Avondale, Columbia Tusculum, Northside and Milford areas September 30, 2017, from 10 am till 4 pm. Some homes have morning or afternoon tour times only. If you have ever wanted to learn more about solar panels, Green Buildings or going off the grid, these homes have been selected because the owners are now the experts! There is no need to register for the tours but we’d like to know if you plan to attend and would like to be notified about future solar tours. Contact: Chuck Lohre, [email protected], 513-260-9025; Walt Fischer, [email protected], 513-739-5353; or Julie Jones, [email protected], 513-477-5814 for more information on any of the tours. You can get more information from these sites American Solar Energy Society’s National Solar Tour and Green Energy Ohio Tour. Andy Holzhauser, Janice Liebenberg and daughter Olivia moved in six months ago to their redeveloped townhome on Elm St. near Washington Park. The home hopefully will be rated LEED Platinum, the highest designation for sustainable development. The Enquirer posted a few photos from the OTR Future Leaders Holiday Home Tour. And here is another article about the home from Brent Coleman with Channel 9. Contact Andy Holzhauser, [email protected], 513-309-7081. The “Finders Keepers” project involves two buildings on a single parcel located near Findlay Market in Over-the-Rhine. It’s named for the ghost sign that’s visible from the Findlay Market side facade. The goals of the project are to develop a commercial storefront, micro-apartments and a single-family residence which will make a significant contribution to the livability of Cincinnati’s urban core. The project is being developed with state and federal historic tax credits and will meet LEED certification standards, further demonstrating that historic renovation and green building can be combined to create a strong future for sustainable living in Ohio’s urban communities. Prior to renovation, the Finders Keepers buildings had been vacant for more than 10 years and had significantly deteriorated from lack of use. The front building, Finders, was built about 1855 and functioned as a cigar store, grocery, laundry, and chili parlor. The project includes retail space on the first floor, occupied by The Rhined artisanal cheese shop, and four energy-efficient micro-apartments with common living area amenities. The rear building, Keepers, was built about 1885 with multiple small apartments for local residents. Its current design will appeal to dual-income urban professional families. The multi-bedroom home incorporates integrated home office/studio space. Goal of LEED Silver certification by pursuing 76.5 LEED points in addition to meeting all the mandatory requirements. Project will achieve 8 points for reusing an existing historic building. Project will achieve all 10 points in the Location and Linkages category given its urban walkable location, proximity to street car and Findlay Market. Project will achieve all 4 LEED points for high-density compact development. Project is pursuing 26 points for energy efficiency, of which 11 LEED points are from the 6Kw photovoltaic solar system. The rest of the 15 points are attributed to insulation upgrade, high-efficiency HVAC and water heating systems. Project will achieve all 6 LEED point for low-flow water efficient plumbing fixtures. Five potential LEED Platinum row houses with solar for sale, open house. 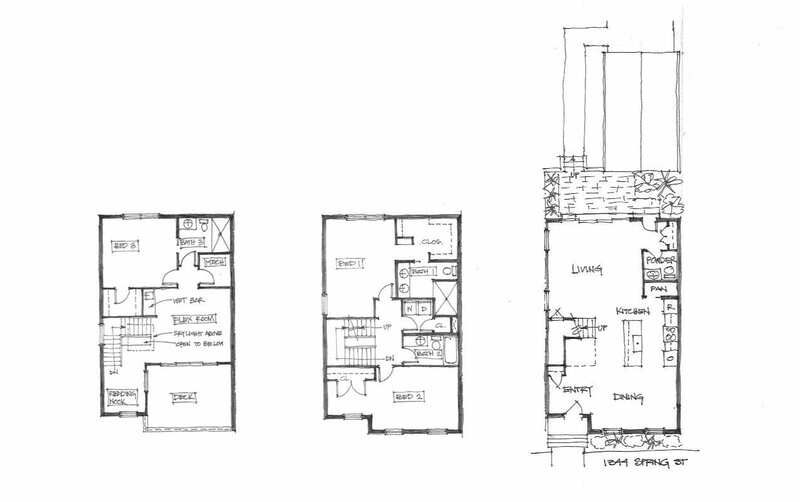 You can download this floor plan sketch illustrating different arrangements. Here is a list of special features for the highly energy efficient town homes. The solar panel contractor is Dovetail Wind and Solar, here is their solar specification sheet which describes the size and type of the array. Contact: Cathy Frank, [email protected], Comey & Shepherd Realtors, 513-478-1296; Architect, Heather Curless of Greener Stock; Developer, Christopher Lacey. This modern style LEED Gold home design has a number of notable sustainable design features, utilizing corrugated metal, fiber cement panels, and cedar on the exterior. Passive solar orientation was implemented in the design. There is a large south facing white metal roof for solar panels/home battery installation. Cincinnati Enquirer article by Shauna Steigerwald, “Cool Homes: In Northside, Minimalist Goes Green.“ Learn more. The owner Casey Moothart participated in every aspect of the design construction and sustainable upgrades of the home for his family. He’d love to share his experiences with you, contact him at [email protected], 619-278-8860. LEED Silver home that’s boiler free. Heating and natural cooling from passive and thermal solar sources. Yes, it has no boiler. It is so well insulated that its only source of heating is from sunlight coming in through the south facing windows and the hot water generators on the roof supplying heating to their floors. Contact the Heather and James Kinsman at [email protected], 513-833-6626. The Kempers purchased their home in 2015. It was built in 2001 by Drees. They are slowly and step by step upgrading for efficiency by installing a 7.56 kw PV system in January 2017 and upgrading the attic insulation. Their PV system is expandable and they hope to be net-zero one day. Contact Bjorn Kemper, [email protected], 513-263-2640. This home addition and remodel was a labor of love for the owners, a yoga instructor and US EPA employee. From design through construction, every detail was chosen to reinforce their mantra of living lightly. The home’s heating and cooling is supplemented with a solar thermal powered radiant floor heating system. Solar PV was installed to offset their energy bills. October 31, 2014 article by Cincinnati Refined. Learn more from Greener Stock’s Houzz page. Contact Chris Nietch, [email protected], 513-262-6608. This modern style home is one of the most energy efficient home in the region. Their first year energy cost was about $200! The home also has the only rainwater toilet flush system we have seen. Learn more at the house blog. Cincinnati Magazine article article April 2006. Cincinnati Magazine article March 2008. Environmental Design and Construction Excellence in Design Award 2008. Architect and owner Krista Nutter is a regular contributor to the Green Cincinnati Education Advocacy blog, contact her at [email protected] and 859-512-3564. Age in place net-zero home with 12.46 kWp – 38 panel PV system. Home features include R23 walls, R48 ceilings, Pella triple pane windows, Honeywell EVR air exchanger. HERS Rating of -3. Chevy Volt daily transportation. Owner and home designer Walt Fischer has helped produce theses tours. His is the only net-zero capable home on the tour and you’ll want to learn from his example if you would like to “stick it to the man.” Contact him at [email protected], 513-739-5353. The prices for solar panels have dropped 80 percent in the last ten years. Payback for a well insulated and sealed home can be as low as 10 years. The home owners on these tours installed their energy generators for more reasons than just dollars and cents, you’ll learn from them that when you do one thing to be more sustainable, it makes other things easlier. It’s a snowball effect they’ll be glad to share with you. We hope you’ll be inspired to take action. But don’t wait too long, the 30 percent tax abatement ends December 31, 2021, Learn more about all the incentives at http://www.dsireusa.org. Greater Cincinnati Energy Alliance will provide you with a free solar assessment of your home via internet aerial imagery in order to determine your home’s solar potential. Go to http://greatercea.org.